Marlins are highly migratory species and occupy the apex predator level in the food chain. Catches have been variable in recent years, but have generally declined. Marlins are managed by the Western and Central Pacific Fisheries Commission (WCPFC). Management is ineffective throughout the Pacific Ocean as no management measures are in place such as stock assessments or recovery plans. There are minor regulations in place to manage striped marlin in the south Pacific region of the western and central Pacific Ocean but these are insufficient to effectively manage the species. The striped marlin population in the north Pacific is unhealthy and fishing pressure is too high. In the south Pacific, the striped marlin population is healthy. Blue marlin populations are healthy throughout the Pacific Ocean. 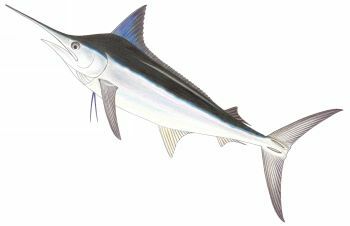 The population of black marlin is unknown. Pelagic longlines are a nonspecific fishing method. Extensive bycatch of sharks, sea turtles and seabirds occurs. The non-target species caught include several of near-threatened or endangered status as designated by the International Union for Conservation of Nature (IUCN). The species of concern include Pacific Bluefin tunas, loggerhead, hawksbill and leatherback turtles. The marlin fisheries put significant pressure on these threatened species. Management is insufficient to protect the bycatch species. Pelagic longlines have minimal impacts on the habitat as they rarely make contact with the seafloor.